Compared to wood, cell suspension cultures provide convenient model systems to study many different cellular processes in plants. Here we have established cell suspension cultures of Populus tremula L. × P. tremuloides Michx. and characterized them by determining the enzymatic activities and/or mRNA expression levels of selected cell wall-specific proteins at the different stages of growth. While enzymes and proteins typically associated with primary cell wall synthesis and expansion were detected in the exponential growth phase of the cultures, the late stationary phase showed high expression of the secondary-cell-wall-associated cellulose synthase genes. Interestingly, detergent extracts of membranes from aging cell suspension cultures exhibited high levels of in vitro cellulose synthesis. The estimated ratio of cellulose to callose was as high as 50 : 50, as opposed to the ratio of 30 : 70 so far achieved with membrane preparations extracted from other systems. The increased cellulose synthase activity was also evidenced by higher levels of Calcofluor white binding in the cell material from the stationary-phase cultures. The ease of handling cell suspension cultures and the improved capacity for in vitro cellulose synthesis suggest that these cultures offer a new basis for studying the mechanism of cellulose biosynthesis. 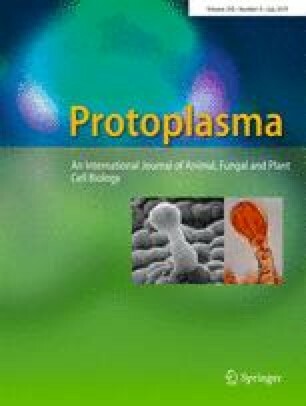 Keywords: Calcofluor white binding; Cellulose synthase; In vitro cellulose synthesis; Populus tremula × P. tremuloides; Reverse transcription PCR; Suspension culture. Correspondence and reprints: School of Biotechnology, Royal Institute of Technology, AlbaNova University Centre, 106 91 Stockholm, Sweden.